I’ve been working over the past couple of weeks for a new short story to debut at this coming weekend’s Noir at the Bar—Saturday, October 7, at The Wonderland Ballroom, 1101 Kenyon Street NW, in Washington, DC. It’s a very short story (where I usually can’t help but write longer)—less than 900 words, in fact, and likely even less once I’m done revising. It’s called “Sunday Morning, Saturday Night,” and I’ve been thinking of Jim Thompson all the while I’ve been working on it, if that gives any small hint about which direction it might be going. 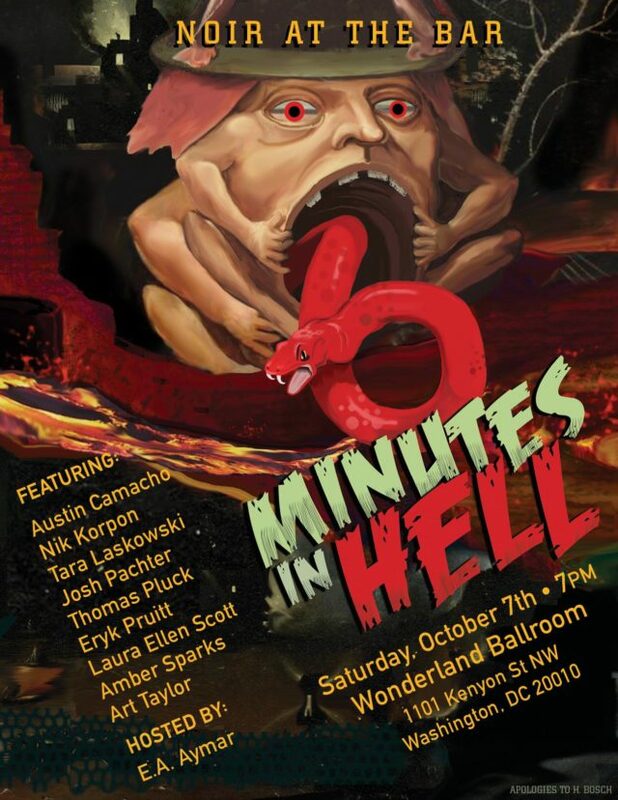 This edition of Noir at the Bar is subtitled “Six Minutes in Hell” and features a stellar line-up of writers, including Austin Camacho, Nik Korpon, Tara Laskowski, Josh Pachter, Thomas Pluck, Eryk Pruitt, Laura Ellen Scott, and Amber Sparks—plus a reading by our host for the evening, E.A. Aymar. And Wonderland, as always, is a joy to visit. They treat us nice. Hope folks will come out to hear my story and hear from all these fine writers!